The correspondence includes reference to Archibald Little and the arrival of Dr.L.Little. 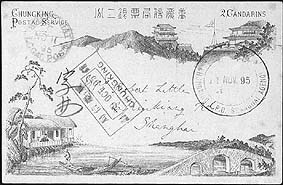 The lack of any intermediate transit marks would indicate this card was carried directly to Shanghai on one of Little's own boats. The Shanghai agency mark is rarely found as an arrival mark.